Wall or ceiling mounted electric heaters for fixed installation in commericial and industrial premises such as factories, workshops, warehouses, etc. The VEA range of electric heaters are available in 6Kw, 9Kw, 14Kw, 21Kw and 30Kw versions for 400V 3 phase electricity supplies. Economical wall mounted electric space heaters for fixed installation in small industrial and commercial premises. Self contained with built in thermostat and controls, for quick and easy installation. Four models available - 3kw 230V, and 5, 9 or 15kw 400V. Activair high air volume fan heaters are designed to be suspended from chains or wire rope in large volume buildings such as factories and warehouses. They have powerful fans which will throw warm air up to 15m, ducting can be used to extend their throw up to 45m. Ace overhead fan heaters are available in 10 or 20Kw outputs for use with 3 phase 400V electrical supplies. The VBX30 is a 400V 3 phase blower / heater, designed for use in high heatloss applications. With a massive 30Kw (102300 btu) output and IP44 protection class (splashable) it is ideal for workshops and factories, and large tents and marquees. The VBX30 has a built in thermostat and two output settings. To ensure safe operation it is fitted with a tilt switch and manually resetable overheat cut-out. The VBX30 blower / heater plugs into a 63A 5 pin 400V industrial socket. Available with 5Kw, 9Kw and 15Kw outputs, Activair portable heaters plug into industrial 400V three phase electric sockets (BS EN 60309) to provide immediate warmth. They are reliable, heavy duty electrical heaters, designed for use in factories, workshops, warehouses, etc. Protected to IP X4 (splash proof) Activair portable heaters are suitable for use in damp, humid or wet environments such as commercial laundries, and can also be used on construction sites. Activair single phase portable fan heaters are robust, heavy duty electric heaters, designed for heating and drying in the most arduous conditions. They are available with 3kW and 5kW outputs and feature powerful fans for rapid heat distribution. 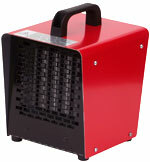 Activair portable fan heaters are protected to IP X4, and can safely be used in damp conditions. 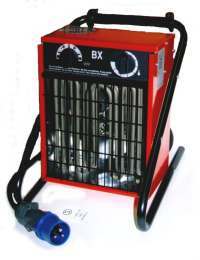 The BX3 plugs into a standard 13A UK socket for immediate heat. The VBX3LV 3kw 110V portable fan heater is designed for use with 110 volt electricity supplies and is fitted with a yellow 32 amp 3 pin BS EN60309 yellow plug. It is splash proof (protection class IPx4) and is suitable for use on construction sites, and in factories or workshops which require the use of 110v portable electrical equipment. The Activair portable heater is a small portable heavy duty 2Kw 230v electric fan heater, designed for use in small workshops, garages, etc. 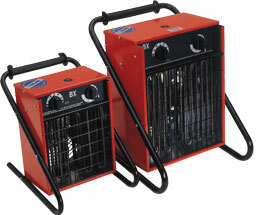 The Activair portable heater measures 155mm(wide) by 215mm(high) by 190mm(deep) and weighs 2.4Kg. A built in handle allows it to be easily carried from place to place. Activair corrosion resistant commercial fan heaters are designed for use in humid, corrosive and aggressive environments such as car washes, sewage treatment plants, fermenting rooms etc. Activair high temperature industrial fan heaters are designed for continuous operation at up to 70C. They are intended for use in industrial drying, curing and space heating applications, and can be wall mounted or stood on the floor. Activair high temperature industrial fan heaters are manufactured from corrosion resistant stainless steel, (casing - SS2320, grilles and floor stand - SS2333) are protected to IP 44, and are approved for use in damp and wet environments. Activair offshore fan heaters are heavy duty heaters intended for use onboard ships and offshore platforms. They are designed to withstand the roughest sea conditions, and are available with 3.6kW (model V3.6) or 6kW (model V6) outputs for connection to 440V 3 phase 50-60Hz electricity supplies. Activair V3.6 and V6 offshore fan heaters are protected to IP 44 and are supplied with a dual purpose floor stand/wall bracket that allows the heater to be stood on deck, or mounted on a bulkhead. Activair enhanced safety industrial fan heaters are intended for use in premises which pose a risk of fire because of airborne dust particles, such as livestock barns, carpenters workshops, mills etc. Activair enhanced safety industrial fan heaters have low surface temperature elements which will not ignite the dust, and have been tested and approved in accordance with Semko 111FF-1987 for 'use in premises that entail a risk of fire'. 3Kw 230V commercial portable infra red heaters which do not produce any visible light, making them ideal for photographic studios and production areas where accurate colour rendering is important. Weighing less than 6Kg, the HC3000P is easy to move from place to place. Fitted with a 1.8m mains lead and standard 13A UK plug, it is a versatile portable infra red heater which can be used virtually anywhere that economical glare free heating is required. 3Kw 110V portable radiant heaters, designed for use in commercial and industrial buildings such as garages, factories, warehouses, etc. Because the Activair radiant heater only heats the persons or objects its infra-red rays strike, not the surrounding air. It is ideal for use in loading bays, entrances, exits, large or drafty spaces etc. The BTQ3 mobile infra-red heater is lightweight and easy to manoeuvre with built-in wheels and a large carrying handle. BTQ3 for 230V operation supplied with a 3 metre power cable and standard 13A UK plug. BTQ3LV for 110V use, fitted with a yellow 32A 3 pin BS EN60309 plug. Twin 1400w short wave infra-red tubes provide instant heat at the flick of a switch, wherever it is required. Tripod mounted 1500w shortwave portable infrared heaters. Height adjustable and easily dismantled for storage and transportation. Ideal for general drying and heating on building and construction sites, as well as drying and curing in car body shops, etc. 110v with a yellow 16A 3 pin BS EN60309 plug. Wall mounted radiant heaters heat people and objects but not the surrounding air. Making them ideal for poorly insulated or drafty buildings where warm air heating is uneconomic. Wall mounted quartz halogen infra red heaters produce short wave infra-red rays and are frequently installed in buildings that are too difficult or expensive to heat using conventional warm air systems. They are particularly suited to large buildings that have high ceilings, are poorly insulated, or very drafty, such as workshops, warehouses, loading bays, churches, animal houses, factories, aircraft hangars, gymnasiums etc. They can also be used outdoors under waterproof covers in street cafes, beer gardens, golf driving ranges etc. Activair electric overhead infra-red radiant heaters are designed for total or supplementary heating, and are suitable for use in a wide range of commercial buildings. They can be attached directly to the ceiling, or suspended from steel wires, chains or threaded rods. They are easy to install, safe, and maintenance free. In buildings with high ceilings or that are used on an irregular basis they can reduce heating costs by up to 25% compared to convector heaters. 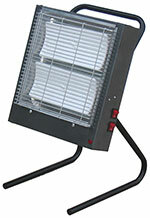 The HLW1500 weatherproof outdoor infrared heater is designed to withstand rain and direct water jets. It is intended for use outdoors either mounted on a wall, suspended overhead, or fixed under a parasol or awnings, but it can also be used indoors where water is present. The quartz tungsten infrared lamp has been developed to deliver instant infrared heat with minimal glare, so users feel immediate warmth accompanied by a comfortable orange glow. Activair ceiling fans can reduce heating bills by up to 30% when combined with warm air heaters. They are particularly effective in buildings with ceilings of 4.5m and above. Electric heating is often considered to be expensive. This is a common misconception, electric heating is controllable, clean and efficient. Activair fan heaters have been successfully used for many years in industry, agriculture and horticulture. They are ideal for space heating, frost protection and condensation control in commercial and industrial buildings, factories, warehouses, workshops, glasshouses etc. To determine the size of Activair fan heater needed, the heat loss from the building must be calculated. This is determined by the size and construction of the building, and temperature lift required. Activair fan heaters are designed for permanent installation. They require external thermostats and electrical switchgear. Activair supplies thermostats and control panels containing everything necessary to complete the installation. Activair fan heaters can be wall mounted, suspended overhead or used free standing. To ensure optimum air distribution careful positioning is important. In larger buildings efficient air distribution is difficult. By using Activair polythene ducting, flexible ducting or metal ductwork, air mixing is improved and running costs significantly reduced. Activair fan heaters are specifically designed for space heating in factories, workshops and warehouses. They are often installed to provide supplementary heating as in this case study. Horticultural heating has its own unique difficulties and problems to overcome. Humidity is high, temperatures can fall below freezing at night and to above 30 degrees centigrade in the daytime. Temperature control must be accurate with minimal temperature gradients. Gas fired heaters produce water vapour as a by-product of combustion. Activair electric fan heaters produce no moisture, making them ideal for condensation control in plant rooms and crop storage. Can't find what you are looking for above? Consult our FAQ for answers to the most commonly asked questions and problems. If you've read through the above pages, checked the forum's and are still unable to find the answer to your query, look here. Copyright � 2003/10, W. Tombling Ltd.